A Silgan (formerly Continental) WHITE CAP Vapor Flow Model VE-LJG STEAM-FLOW VACUUM CAPPING MACHINE, with CAP HOPPER-SORTER; an inline high-speed steam-capper. Model 6R17 cap hopper-sorter, hand-adjustable to feed / apply approximately 48mm to 72mm cap diameters (subject to confirmation with your sample caps). 10 foot 8 inch long through-conveyor with 4.5 inch wide stainless steel table top-chain, running in a left to right container flow from the perspective of the operator control panel position. A straight-through in-line capping machine which will accept random or time-fed jars at high rates of speed. For applying PT (press-on and twist-off) caps. Complete with control panel, 3 phase drives, assorted steam controls and valves. As of this writing, this steam-flow lug cap capper is in stock at Alard, in very good operational and mechanical condition, available for timely shipment; needing only minor cosmetic cleanup, and a test run to confirm operation with your cap and container samples prior to shipment. CALL 315-589-4511 to confirm availability, and to discuss your particular food process bottle and jar cap application equipment need. Z-SHAPED ELEVATING BELT CONVEYOR, with cleated belt, all stainless steel body, with 13 inch wide by 11.5 foot long interlocking plastic chain type belt. Hexcore S-shaped incline conveyor configuration with a 24 inch long infeed section to an 8 foot long incline section to an 18 inch long discharge section. Intralox type / plastic interlocking chain type conveyor belt with fine perforations (would allow water to pass through), with 1 inch high cleats on 6 inch centers running between 6 inch high UHMW plastic sidewalls which ride over the belt edges. The overall belt width is 15 inches, the cleats are 13 inches wide, and the UHMW sides that ride over the belt edges are 3/4 inch thick. 11 inch infeed height, 83 inch discharge heigh, on 4 inch high locking casters. Comes with an air / water nozzle over discharge section. Complete with stainless steel shrouded motor, safety mergency-stop pull-cords along on each side of the belt conveyor, with a stainless steel control box with on-off switch. As of this writing, this gooseneck elevating feed conveyor is in stock at Alard in excellent, LIKE NEW condition, available for immediate shipment. Brown International 2503 extractor-finisher-separator / screw press, manufacturer recommended for extracting, finishing, and de-watering, separating liquids from solids with minimum degradation of solids for a wide range of diverse materials such as citrus products, apricots, tomatoes, pears, apples, plums, grapes, strawberry, aloe vera, and pineapple, and many other fruits, vegetables, spices, seeds, meats and materials. Separation of liquids and solids is accomplished by means of a rotating auger inside a cylindrical screen. The liquids and controlled amounts of solids pass through the screen while the remaining solids (pomace) are discharged through a non-rotating pneumatically adjustable valve. Dryness of the pomace can be accurately controlled by simply varying the air pressure on this valve. Production throughput is dependent on the type of product being processed, screen hole size and open area, rotational speed of the screw and air pressure on the discharge valve. 4 inch by 8 inch flanged rectangular infeed. Comes configued with a .020" perforated screen (other sizes available). Pneumatically operated discharge regulates discharge moisture content. Bottom liquid collection tank with 4 inch thereaded center bottom outlet. 20HP 3 phase belt & pulley drive. As of this writing, this Brown 2503 FINISHER is in stock at Alard, in good condition, available for timely shipment. Model A EZ-Adjust brush pulper. Stainless steel construction including tubular support frame. 14 inch by 20 inch tapered hopper infeed. Brush paddles crank-wheel adjustable for distance to screen. Currently fitted with 3/8" perforated screens, other sizes available. 15 HP 460 volt 3 phase drive. High output, manufacturer rated for 10 to 20 tons per hour. 43.5 inch infeed height, 18" solids discharge height. 12 inch high liquid discharge with 4.5 inch diameter outlet. Pulper-finishers are used to create juice from fruits and vegetables, and/or to otherwise separate fruit flesh (pulp) from fruit pits, seeds, and other solids (stems, skins). Pulping / finishing machines use either spinning paddles, or a screw, turning inside a perforated screen. The screens are interchangeable, and the perforation size of the screen determines the "finish" of (amount of pulp in) the product. The use of brushes, which are gentler than solid paddles, helps to prevent skin or seed shattering, as well as to remove the remaining fruit from pits. Liquids (and pulp) that pass through the screen are collected in a bottom discharge pan, while the solids (pits, seeds, skins) remaining inside the screen are discharged out the end. As of this writing, this refurbished brush pulper is in stock at Alard, ready to go and in EXCELLENT operational, mechanical and cosmetic condition, available for immediate shipment. RECONDITIONED PULPER, Langsenkamp Model A EZ-Adjust paddle pulper. Pulper-finishers are used to create juice from fruits and vegetables, and/or to otherwise separate fruit flesh (pulp) from fruit pits, seeds, and other solids (stems, skins). Pulping / finishing machines use either spinning paddles, or a screw, turning inside a perforated screen. The screens are interchangable, and the perforation size of the screen determines the "finish" of (amount of pulp in) the product. The use of brushes, which are gentler than solid paddles, helps to prevent skin or seed shatering, as well as to remove the remaining fruit from pits. Liquids (and pulp) that pass through the screen are collected in a bottom discharge pan, while the solids (pits, seeds, skins) remaining inside the screen are discharged out the end. Solid paddles crank-wheel adjustable for distance to screen. 15 HP 230/460 volt 3 phase drive. 44.5 inch infeed height, 19" solids discharge height. 13 inch high liquid discharge with 4.5 inch diameter outlet. 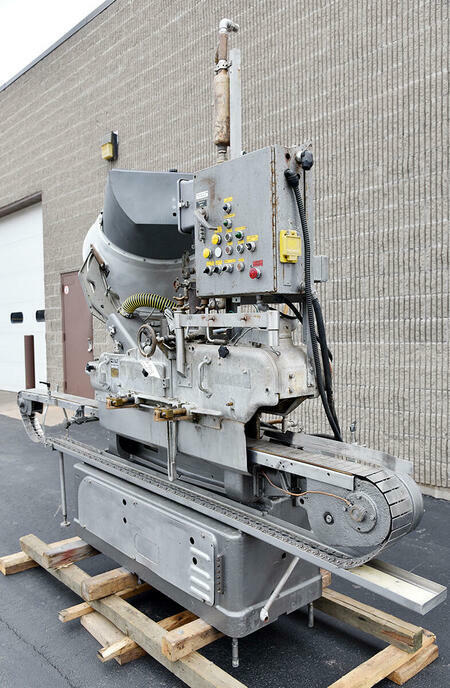 As of this writing, this refurbished paddle pulper is in stock at Alard, ready to go and in EXCELLENT operational, mechanical and cosmetic condition, available for immediate shipment.